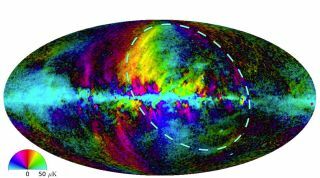 The loop of dust that appears in the Planck image (and is indicated by a dotted line) was discovered more than 50 years ago. Astronomers still don't know how big it is, and it could be anywhere from 400 to 25,000 light-years away, according to a statement from the Royal Astronomical Society. An image of the ring around the star Lambda Orionis, made with the ESA Planck satellite. The ring, here seen in pink, is around 200 light-years across. In the image, red represents the anomalous microwave emission, green represents the emission from interstellar plasma and the blue is emission arising from electrons moving in magnetic fields. Scientists do know that the loop is almost perfectly circular, that it also emits X-rays and that it is bordered by cold gas; many researchers think that it's a pre-existing cavity in the interstellar gas and dust that was re-energized by supernovas and began emitting microwaves. The galaxy's microwave radiation can come from various processes including collisions between particles in the interstellar plasma (charged gas) and vibrations of dust grains caused by heat. But the particular wavelength of microwaves depicted in this map is created by something so unusual it's referred to as anomalous microwave emission, or AME for short. Scientists think AME may be caused by spinning dust grains, the statement said. Another view gleaned from the same data shows a ring of dust 200 light-years across that circles the star Lambda Orionis, which appears as the head on the constellation Orion. That ring is particularly bright in the unexplained AME. The images were presented July 8 at the Royal Astronomical Society's National Astronomy Meeting in Wales, and the work has been submitted to Astronomy & Astrophysics.